The BBC1 TV show Sherlock had a new 90 minute episode January 1st. The show is usually a modern interpretation of Doyle's canon, but "The Abominable Bride", this special episode, takes place in Victorian Times. Even if it's not your kind of thing, it's worth watching just for the Victoriana... but there's a little more than that! I have to say I was slightly disappointed with the Sherlock special I feel it didn't hang together well. The plot seemed muddled. It reminded me of the Royal Conspiracy Theory! Yes, agreed. Apparently it was all taking place in modern-day Sherlock's "mind palace" as he tried to solve a case in his drug-induced haze, using the old case as an analogy (or something). They made it part of the set-up for next season, instead of a stand-alone story. Review of the "Sherlock" special-- contains SPOILERS! Apparently the writers took the title from one of the dozens of non-story, story references of the Holmes-Watson adventures that were never written up. In this case the unwritten story was called , "Riconetti of the club foot, and his abominable wife." Here it was called "The Adventure of the Abominable Wife", whose name is Emily Riconetti. The story was curious, and fit into how the modern series ended with Holmes being brought back from a legal exile after what would be termed a "public service" murder he commits. He has to understand how one of his foes apparently survived to return to England, and he is recalling the earlier case (from 1895), which hinged on the same situation. ^^ "The Abominable Bride" not "Wife", Mayerling. Yes, I also thought there was an echo of Holmes' mysterious cases, which, he told Watson, "the world is not yet ready for", lol. Adrian Conan Doyle (the author's or "agent's" son, depending on your sense of Watson's real personality you accept) wrote a book of stories with John Dickson Carr entitled "The Exploits of Sherlock Holmes" dealing with telling some of the unwritten stories. Occasionally I think of some of these little pieces of whimsy from Sir Arthur. Like the case of "the Grovesnor Square Furniture Van" (which I imagine is parked outside a home on Grovesnor Square, quietly removing furniture, only the owners of the home did not order it to do so). There was also "the adventure of the lighthouse, the politician, and the trained cormorant" and "the adventure of the red leech, and the terrible death of Crosby the banker". Doyle was wonderful with words getting great mileage out of them with no room to spare. Now if only one could locate the "island of Uffa" so we can find out what happened to the "Grice-Peterson Family". The paragraph below from Doyle's A Case of Identity, especially the bit about the teeth, had me creased up when I first read it around the age of 10-11. 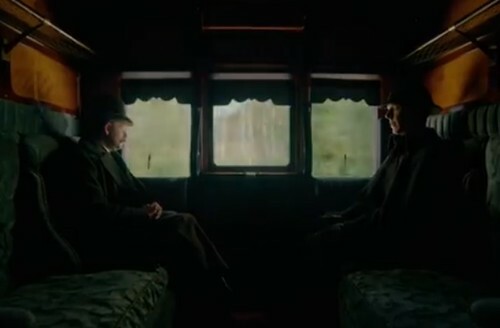 Holmes is telling Watson how life is stranger than anything that the human mind can invent. 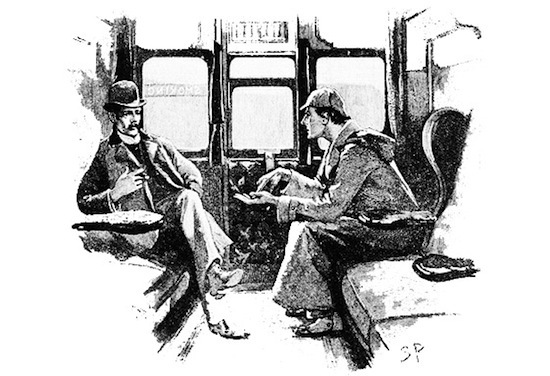 I thought this was a clever bit of re-creation of an original Sidney Paget illustration -- Paget's rendering of Holmes & Watson in a railway carriage in "The Adventure of Silver Blaze" and as Cumberbatch and Freeman appear in "The Abominable Bride" -- nice attention to detail! At RipperCon in Baltimore on April 8-10, Janis Wilson and I will be talking about "The Ripper, Sherlock Holmes, and Sir Arthur Conan Doyle." For complete details on RipperCon speakers, schedule, and costs etc., go to http://RipperCon.com/.